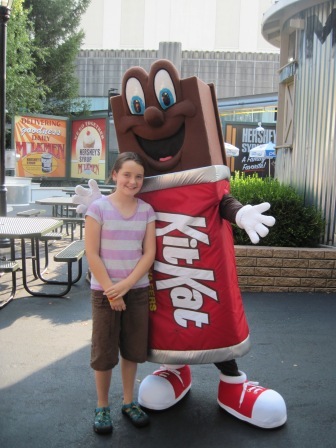 Today we went to Hershey Park in Pennsylvania. The night before we went to the park for a day, we went to the park preview just to see the park and get a feel for our plan. First we went to Chocolate World and went on a tour of the “factory”. Then we went down to the park and did a lot of rides. We started out easy and worked our way up to the bigger rides. I loved seeing the park all lit up; I especially liked seeing the Boardwalk. The Boardwalk was set up like an old fashion boardwalk with the ferris wheel and ice cream parlor; it was really neat to see at night. I enjoyed the wooden roller coaster because it was fast and bumpy but long and curvy instead of going upside down. We stayed in the park until closing and we definitely felt we got our money’s worth. I had never been in the front of a roller coaster before so I had a thrill ride on the Great Bear.